The Pipeline Division of Indian Oil Corporation Limited (IOCL) ascertained its preparedness to respond to emergency situations by conducting a mock drill on Friday at Mahizhampadi village in Lalgudi Taluk. 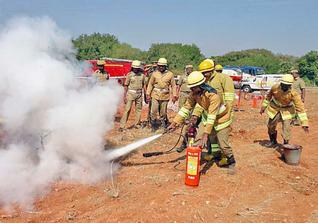 The IOCL team teamed up with Tamil Nadu Fire and Rescue Service department for the off-site mock-drill. The department personnel demonstrated various techniques of fire-fighting and extinguishing methods, and the methodology to rescue injured people. Participants received well a discussion on life-saving methods in first-aid conducted by St. John’s Ambulance services and were given calendars containing information about the important telephone numbers to be contacted in case of emergency situations along the 683-km Chennai-Tiruchi-Madurai pipeline, the country’s longest in a single State, that delivers petroleum products to most of Tamil Nadu. Initiating the mock-drill in the presence of Lalgudi tahsildhar Stella, IOCL Chief Operation Manager S.S.Chourasia solicited the cooperation of villagers by not constructing permanent structures, avoiding digging wells, or borewells, and desisting from raising trees along the pipeline. Those providing firsthand information on emergency will be suitably rewarded, Mr.Chourasia said. Divisional Fire Officer Syed Mohamed Shah evaluated the mock-drill favourably with words of appreciation. The operation was coordinated by R.Devakumar, Deputy Manager (Operations), IOCL, Vazhavandankottai Terminal. Village Administrative Officers and representatives of Mahilambadi and Valavanur panchayats took part.